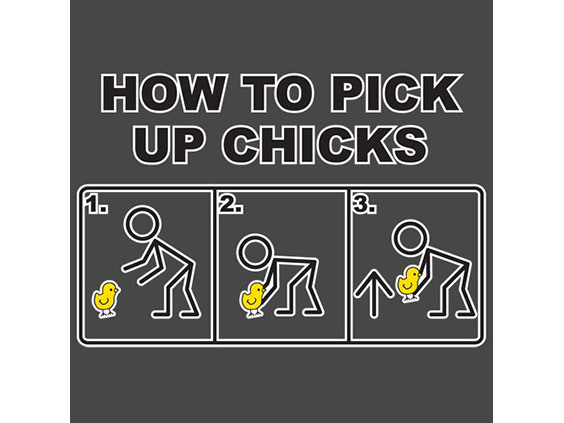 How to Pick Up Chicks - Haba Naija! When you set out with the intention of picking up a female, the very first thing you must do is not get stuck thinking that you can only find girls to date when you’re out at a party or at the bar/pub: There are perfectly date-able girls everywhere you go (No MTN). You will find them on the street, in a store, in class, and even on a bus. You just have to be ready to meet that someone, and that is why we are here. Before you even begin to attempt to think about picking up women, You must practice. Yes, practice talking to women in general daily. It doesn’t matter whether you find them attractive or not. The aim is to get used to talking to women. In fact, it’s best to start by practicing talking to women you don’t want to go out with. Talk to the waitress or cashier, the women in line with you, the women waiting for the bus with you, or sitting next to you on the bus. You’ll be surprised at how much more comfortable you’ll become talking to the women you want to be picking up when you’ve had ample practice talking to women who you don’t. Also, practice when you’re by yourself, if possible in front of a mirror. Listen to how your voice sounds when you say “Hi” and introduce yourself, and watch you facial expressions and other body language. Practice really does make perfect. Be Original: If the girl is really pretty, and I’m betting she will be, then she probably has people telling her all the time how hot/cute she is, and now sees them as nothing more than empty compliments. You don’t want to be just another guy telling her something she’s already fully aware of. I mean, yeah she’ll appreciate the compliment, but the chances of her being interested in you are pretty slim. Instead, think Triple C – Cool, Calm, Casual. Tease her a little by saying something like “Wow, that’s a big purse! Do you live in there?”, but avoid comments on her appearance. Be Yourself: You’ve probably heard this over and again, but a lot of guys still don’t quite get it. You may think “be yourself” means that you can be rude, obnoxious, aloof, or ridiculously shy because that’s you, but NO. All this means is that you should treat a girl you’re interested in normally, like you would treat anyone you’re already friends with. Here’s a typical example – you’re at a coffee shop and she wants you to go wait in line to get her another doughnut. It’s possible that she just wants to see if you’ll jump through a hoop for her. Do not fall for it! Would you go through that much stress if you were just hanging with a good friend? Don’t show her any preferential treatment – not just yet, anyway. Plus, few ladies will admit it, but there’s something extra hot about a man who has a mind of his own. Get Her Number: When you’ve reached the climax of your conversation, ask for her number. Tell her you’re having an awesome time, but you need to get back to whatever it is you were doing before you saw her. If she’s reluctant, make a joke about calling her an obscene amount of times. Do not get offended and make a rude remark, because then you’re back to square one. If she’s still hesitant, then you could just get her email address instead. Text Immediately, Call Later: The rule about waiting a couple of days to call was made for guys who acted too needy on the first meeting, But the truth is if you really were too needy, then waiting to call isn’t going to help that much. If you weren’t needy and perfectly charming, there’s no reason you have to wait, and the girl is most likely eager to hear from you. Text her when you leave the venue, and then call her at a respectable hour the next day. When you call, don’t be like “Umm, this is *insert your name*. We met at the bar the other night.”. You want to remind her of how much fun you had, so think of something quirky to say when she picks up, preferably relating to something you discussed at the first meeting. 1. If it seems like you’re being too needy, then you probably are. Calling and texting her every day is highly unnecessary. Especially when there really isn’t much to say besides “Just wanted to say hi.”. It’s okay to step back and leave a little breathing space. 2. Some girls have a lot of suitors and may get confused about who you are. It’s important to exercise some patience and be willing to text or call them back three or more times saying who it actually is because it’s also very possible the other guy calling and texting her may have a similar name or look. Impress her with your confidence and patience by continually reminding her who you are. So, that’s it! You are now equipped to effectively pick up chics. Of course, nothing is a 100% certain, but things should progress well if you follow these simple steps. Good luck!